Of course my age has something to do with this as well. Most if not all companies that I have contacted are actually looking for younger people or just pay minimum wage with no benefits or sick leave. Also, many are just looking for temporary workers, and let people go after three or four months. All this, as you may imagine, has affected my attitude towards finding work. I'm finding that I am getting into states of depression and feelings of hopelessness lately. All of my life I have been a very positive person and able to get through tough times with various amounts of difficulty. Married and divorced, deaths in the family, out of work, no vehicle, no bus fare etc have all been managed and somehow I made it through them. However, this period in my life is proving to be the most difficult ever. I don't really know where to turn next. Soon, I will be contemplating giving up my cheap apartment, trashing 90% of my worldly possessions, and seeking lodging at the nearest Sally Ann, with a knapsack. I find it very hard to write in here now. My mind is not where it usually is. To live in society, you must have plenty of money these days. Without it, you hardly exist. My close friend Mark, has helped me mentally by getting me to do a little camping in our hammocks. He introduced me to the benefits of hanging and I found that it even helps my aging and aching back. So mentally and physically I have had that to help me continue. 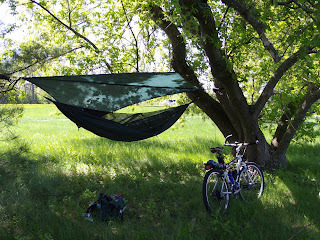 I took a bike ride to the Ottawa River the other day and set my unit up in a shady little spot, to escape the hot sun. Here's a picture of my camp along with my old bike. It felt great to be out in the fresh air with this simple, home in the woods, concept. Along with a little food, it felt like it was all that I really needed to be happy right now. I love simple things. Even though that trip lightened my mental load, I just don't think I can use that anymore to out weigh all the negative stuff that's now trying to blast me out of existence. Last but not least, I think that I am perhaps the loneliest person in the world. People that I can call real friends also have their own lives to worry about and take care of, so I try to never burden them with my problems. Is this what it's like for hundreds or perhaps thousands of others out there now? Being poor or old or injured, most certainly does effect how one thinks and even acts. Did I mention I picked up 29 beer cans while out with the hammock? Yup, turned them into some tuna and a Mama rice pack food from the Dollarama store. Sure glad they pay 10 cents per can up here now. I'm researching places on the net, where I can sell the little box of computer CPU's that I have been collecting for the last few years. Hopefully the shipping charges won't kill the deal.